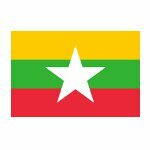 January 4 is Independence Day in Myanmar (formerly Burma) that is observed every year since 1948. That's the day when Myanmar became independent from Britain and changed its name into Union of Burma. Burma was colonized by Britain in the 19th century after three Anglo-Burmese Wars. In 1937 Burma became separate colony of Britain with Ba Maw as the first Prime Minister and Premier. Ba Maw wanted Burma to gain its independence from Britain and opposed its participation in World War II. Later Ba Maw was arrested for sedition and he resigned from the Legislative Assembly. In 1940 the Burma Independence Army was formed and it fought during World War II with Japanese. By 1942 Japanese troops advanced on Rangoon and the British administration collapsed. Japan administered Burma till 1945, but during its administration many Burmese switched allegiance to the Allied side. Great Britain tried to reestablish its administration in Burma but Aung San, nationalist, revolutionary and founder of the Burma Independence Army, started negotiation with British to guarantee independence of Burma. In 1947 Aung San became Deputy Chairman of the Executive Council of Burma but he was killed during political rivals backed by British. Only on January 4, 1948 Burma became independent country with Sao Shwe Thaik as the first President. Burma didn't become the member of Commonwealth, as most other British former colonies did.